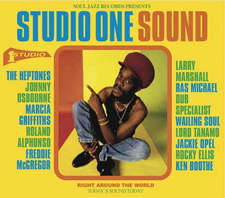 Another Studio One CD compilation from Soul Jazz. Tracks from the mid sixties up to the late seventies and a mix of Ska, Rock Steady and Reggae. Well put together and all tracks blend very well indeed. They dug deep to find some of these tunes, stand out track got to be Slim Smith with "Hip Hug". It's a bit confusing why they have a photograph of Dennis Brown, on the cover, when he does not appear on the CD! Notes by Rob Chapman. Issued on Soul Jazz Records SJR CD256.